Pillarhouse JadeMKII Selective soldering – APEX EXPO #adafruitAPEX @IPCShow #IPCshow #apexexpo « Adafruit Industries – Makers, hackers, artists, designers and engineers! 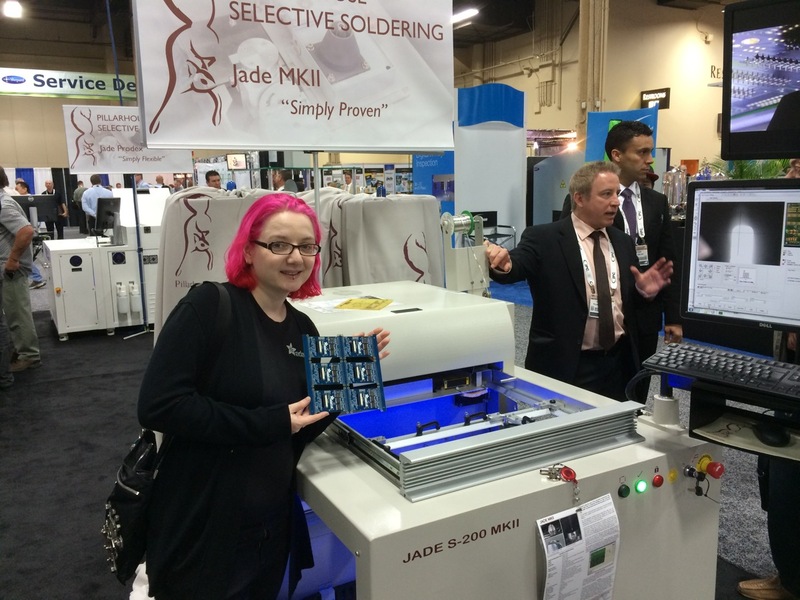 We are at the APEX Expo looking for a selective soldering machine, we stopped by the Pullarhouse booth to check out the Jade Series – specifically the Pillarhouse JadeMKII Selective soldering machine. Selective Soldering is the process by which conventional leaded components are soldered onto a printed circuit board. This process is usually conducted after the surface mount reflow soldering operation. 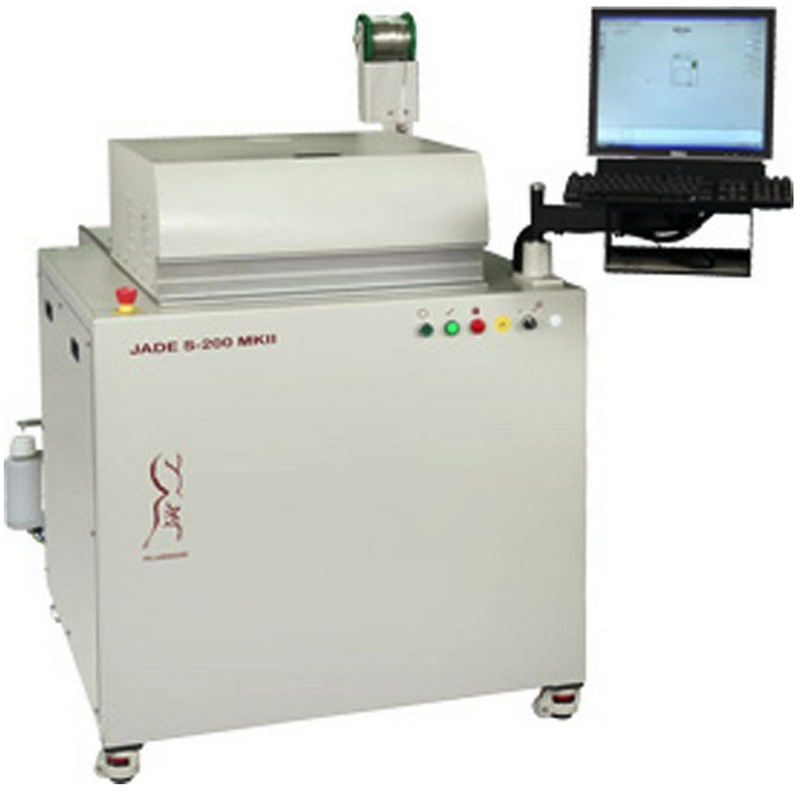 With the increasing popularity of Lead Free solder and its associated high cost to fill a large conventional wave solder machine bath, Selective Soldering offers a significantly lower cost approach with inherently smaller bath design and the added advantage of quick change capabilities i.e. from lead free to eutectic and vice versa. It is often necessary to process leaded components which are in a very close proximity to surface mounted parts. Selective Soldering offers the ability to accurately control a nozzle flow under nitrogen inertion so that parts can be soldered without any damage to the nearest surface mount devices. In some cases we can solder points as close as 1mm to the nearest surface mount component, thus offering a highly flexible and cost effective solution. For users who demand a small footprint but large board capability the new JadeMKII is the perfect fit. by incorporating a board support system that can hold a PCB of up to 457mm x 508mm (18″x20″) along with its simple hand load operation provides the user with great flexibility for quick changes in small batch processing which keeps the cost down and the production up. Thousands of industry professionals from more than 50 countries attend this premier event— featuring advanced and emerging technologies in printed board design and manufacturing, electronics assembly, test and printed electronics! Find new suppliers with new solutions and connect with colleagues from around the world. There is even a hand soldering competition on Weds 1pm to 4pm at booth 2713 (more special events here). This year’s show brochure is here follow along our coverage on Twitter @adafruit with the tag #adafruitAPEX here is the mobile version of the schedule, directory and more.